Global warming is smouldering beneath this summer's heat waves and forest fires. Back from vacation? Perhaps you visited the Mediterranean? Good timing, since the Norwegian news channel NRK reported a few weeks ago that this would be impossible in the future. It'll be too hot. In other words: quick, before it becomes unbearable on the Spanish beaches, take an airplane to the South. Obviously, I do not need to explain the irony here. By the way, it isn't that great in southern Europe already. A heatwave with temperatures up to 40 degrees hit the region this week, and this certainly wasn't the first this summer. Does this mean that climate change has struck already? Perhaps. A few years ago, climate scientist James Hansen showed that the frequency of hot summers has increased substantially in recent decades. Although a single heatwave isn't proof of global warming, the fact that they are occurring more often is precisely that. The stifling heat that's holding southern Europe in its grip fits that pattern. We can only hope that this hot summer does not lead to a high death toll, like the European heatwave of 2003 which led to nearly 15.000 fatalities in France alone – particularly among the elderly. It's clear that fear has taken hold though, since the current heatwave received the nickname "Lucifer". Diabolical heat, which needs to be cast out. So those with enough money buy air conditioning. A curious detail: since air conditioning cools your house by blowing hot air outside, too many of these devices in the same area can lead to even more heat on the street. People who can't afford air conditioning suffer even more as a result. But the heat also causes other problems which can't be solved with air conditioning: forest fires. More than ten thousand people had to be evacuated from the French Riviera at the end of July due to severe forest fires in the area. Photos of tourists who had to sleep on the beach, because their hotel could burn down at any moment, appeared in media around the world. Meanwhile, there are forest fires ongoing in Italy, on the Balkans, and in Portugal where 64 people died last June when they were surrounded by the fire. Climate change, however, is often just part of the underlying cause, not the immediate reason for the fire. About 90% of forest fires are started by people instead of natural causes such as lightning. This doesn't need to be reckless use of a barbecue or a camp fire. No, it also happens on purpose. Last Monday, a member of the fire brigade on Sicily was arrested because he set fire to the forest now and then to create more work for him and his colleagues. Also, many forests are located on valuable land which becomes available after a fire, and forest fires can be used by organised crime as leverage or as a way to settle accounts. In the tropics, forest fires are used to clear land for agriculture, where they don't even try to sell the tropical hardwood. Tourists are enjoying the sun on the beach of Lavandou while smoke is rising from the hills behind them. 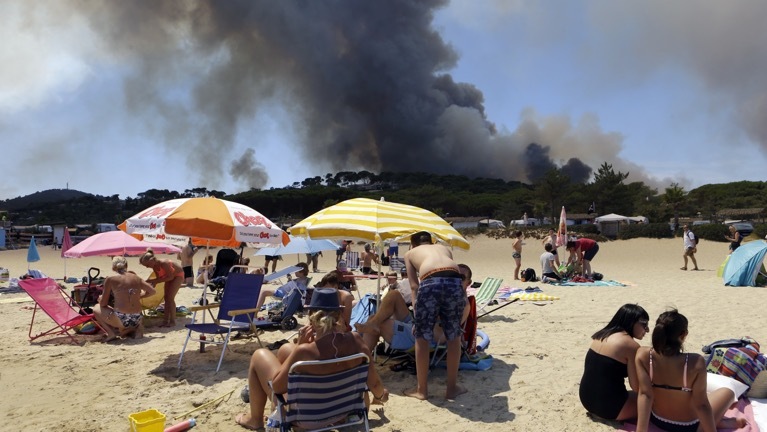 In July, the French authorities had to evacuate more than ten thousand people from the Riviera because of severe forest fires in the region. Still, a fire now and then is less problematic for the forests of the Mediterranean than you'd think. Fire has always been a recurring element of the Mediterranean climate, and many species are adapted to these conditions. The cork oak, for example, is well protected against fire and can recover quickly when competing species have been eliminated by a fire. Actually, the suppression of fires can have an unwanted effect because this leads to a larger build-up of plant material, which means that the next fire will have more fuel and will burn more intensely. In that case, the forest will get into trouble. Regardless, forest fires are bad news for climate change, since they release a lot of CO2. And not just that, but also the much stronger greenhouse gas methane. It's mostly released by fires that smoulder for a long time. This is the case for fires in Scandinavia, and in Siberia and Canada, because more mosses grow in the forests there and their soils hold higher amounts of carbon. During a fire, this can't combust completely and methane is released. The underlying climate problem is only worsened as a result. Sadly, fires are increasing in the northern part of the world due to longer summers. If we don't solve the climate problem, we won't have to travel far to experience Mediterranean conditions. While I'm writing this, I'm far away from the Mediterranean, on fieldwork on Spitsbergen. Heatwaves don't happen here and trees don't grow here either. You might think that the Arctic is far removed from the issues that plague the Mediterranean. But unfortunately, I just received the latest news from West Greenland. The tundra is burning, too.